Sometimes the path forward in your career is not so obvious. Other times it's so painfully obvious that life just pushes you into the deep end of the pool because you're meant to be a world-class swimmer but can't if you just keep dipping your toes in the water. That's basically what happened to our friend Dave... luckily he can swim with the best of them! With years of design experience with a top media company, along with his own creative endeavors with paper-based art, he had always felt like he could be sharing his insights to help creatives get their business out of the ruts he saw happening all the time. Plus, if you want to ask him questions yourself, make sure you sign up to hear him at our Next Level Workshop on October 26! Q: So... What is it you exactly do? A: I am an art director, media strategist and author. I help creative entrepreneurs craft better communication and take their businesses to the next level. I am designing occasionally, but only for select clients and personal projects. My design efforts are more on the art direction side, helping others make their designs better. Q: You have an interesting story on how you got to doing business for yourself full time... can you talk about that? A: I had been languishing my day job as a magazine art director for years. I wasn't inspired by the work I was doing and I desired more. When I finally started chasing after my dream of becoming an entrepreneur, I ended up hating my day job more. One day, I was having a conversation with a colleague about my disdain. She was a former HR director for large corporations and she said that a company like the one I worked at probably had a mandatory amount of head count they had to lose each year. I could go to my HR department and volunteer for the next round of layoffs. No matter how many times I tell that part, it still sounds completely nuts, but the thought percolated in my head for the rest of the weekend. That following Monday, I trudged into the office, sat down at my desk and sighed to myself, "I don't want to be here". I turned on my computer, opened my email and the first note there was a notice that I had been scheduled a meeting with the Executive Director of Media Operations, a high level suit I had never met before. I got another message that was a meeting immediately following mine that was an all hands on deck meeting for our group. The writing was on the wall. I walked out of the building later in the afternoon, boxes full of my stuff in hand, with mixed emotions of fear and pure joy. I put my message out into the universe and it answered me, in spades. The time for me to do my business full bore was now, and that's where I am now. Q: Why did you decide you wanted to work with creatives? A: Through many conversations with several creative types (artists, designers, photographers, etc. ), the most common problem I've seen has been the lack of direction and knowledge on how to make their businesses bigger than they are now without killing themselves with workload in the process. There is a very antiquated ideology amongst creatives that you must pay your dues and you will never become rich off your efforts, so you slave away for the pleasure of creating art. To me, that's a load of crap, and with a simple adjustment in mindset, I can help any creative individual become more productive, more profitable, with the same amount of work or less. I really despise the "starving artist" mentality, and most creatives wear it like a badge of honor. I'm the guy taking the badges back and giving out the superhero capes instead. Q: How do you see yourself helping makers? A: It all comes down to shifting mindsets on how business can be done, and providing tools to help them get there easier, faster, and better. Q: What's the problem you deal with the most with creatives? A: They are control freaks, almost all of them. They cannot relinquish control of their work because they feel every aspect of it is what makes their work into art. Everything from buying supplies and creating work has the same value as filling out paperwork and fulfilling orders in their minds, so it all has to be done by them because they are the artist. It's hugely problematic for them and they will never get beyond their level of business if they don't get past this mindset. Q: You're creating a curated art show that is supposed to be like none other... details! A: The details on this are still coming together, so it's tough to say just yet, but the idea is to provide an event strictly for Southern California artists where they can showcase and sell their work to a legion of new fans without being part of the "gallery" set. A standard gallery owner can usually showcase art from a couple dozen artists a year, and they all tend to drink from the same watering hole of artists. The Fresh Jam Show will give a whole new crowd of artists an opportunity to share their work without traditional gallery obstacles. 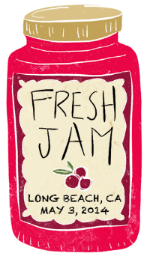 Unlike other art/craft events in the Los Angeles area, Fresh Jam will be new, fresh talent every time we hold it. The idea is two-fold: help independent artists sell their work, and potentially get "discovered" by other art purveyors. Pie in the sky idea: If things go well, we would like to take the show on the road and do the same in other locales, expanding the visibility of artists in many towns across the country. Getting in to the show will be a simple as applying and then making it through the application process. Each artist will be hand picked by me and a team of curators. Q: What do you feel like your business offers makers? A: The mission of Fresh Rag is to provide entrepreneurs a no BS, straight talk approach to earning more from their creative pursuits. I offer an eye-opening experience to the new realities of doing business in 2013 and beyond, both with coach-like motivation, as well as tactical resources for getting the job done. Q: You've become a stay-at-home dad while juggling your new work from home... what's that been like? A: The single biggest challenge of my life. I watch my son two days a week. Getting any work done on those days is near impossible, so I have to be extremely efficient with my time on my other days so I can spend all my energy focused on my boy. Q: Where can people find you and your stuff? A: You can find the majority of what I do at FreshRag.com. The Fresh Jam event site can be found at www.freshjamshow.com. A: What I provide is tools, but a tool is only as effective as the person using it. You swing the hammer and I'll hold the nail.